VATICAN CITY (CNS) — Appealing to the international community to help bring peace to Syria and Iraq, Pope Francis and Catholicos Gewargis III, patriarch of the Assyrian Church of the East, also paid homage to the lands’ persecuted Christians, who demonstrate that faith in Christ is a bond that is stronger than any denominational difference. “Just as the blood of Christ, shed out of love, brought reconciliation and unity and caused the church to flourish, so the blood of these martyrs of our time, members of various churches but united by their shared suffering, is the seed of Christian unity,” said a statement signed Nov. 9 by the pope and the patriarch. The two leaders signed their joint declaration in the Redemptoris Mater Chapel of the Apostolic Palace after praying together, particularly for persecuted Christians and for those who have felt forced to flee the Middle East. The patriarch, who is based in Irbil, Iraq, leads a church of about 400,000 members with parishes in Iraq, Iran, Syria, Lebanon, North America, Australia and India. The Assyrian Church of the East, which is closely related to the Chaldean Catholic Church, is engaged in a variety of ecumenical dialogues, but it is not in full communion with any other church. In 1994, then-Catholicos Dinkha IV and St. John Paul II signed a common Christological agreement, which expressed the two churches’ common faith in Christ’s incarnation. In 2017, the Catholic-Assyrian Church of the East dialogue commission issued a joint statement on the sacraments, including holy orders and the Eucharist. “We are most grateful for the fruits of this dialogue of love and truth, which confirm that a diversity of customs and disciplines is in no way an obstacle to unity, and that certain differences in theological expressions are often complementary rather than conflicting,” said the joint statement of Pope Francis and Catholicos Gewargis. “It is our prayerful hope that our theological dialogue may help us to smooth the path to the long-awaited day when we will be able to celebrate together the Lord’s sacrifice on the same altar,” the two leaders said. 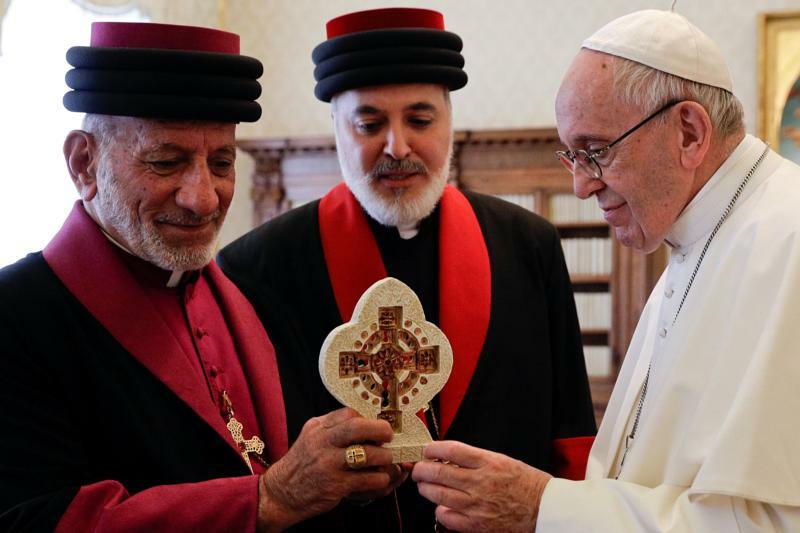 In his speech to the pope, Catholicos Gewargis focused on the importance of a Christian presence in the Middle East and how that is challenged each day by violence and discrimination. “The many decades of war, violence, religious hostilities and sectarianism have had an inevitable and sadly irreversible effect on the ancient Christian communities of the East,” he said. “What we have witnessed in both Iraq and Syria in the last 15 years is a living testimony to this grievous situation of the forced departure and displacement — both internally and externally — of millions of Christians from the region of the Middle East.